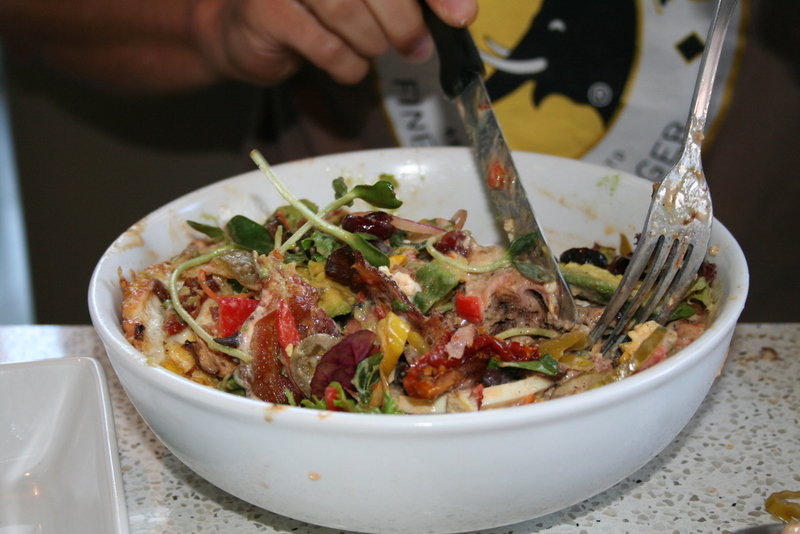 ONE MAN AND HIS ATTEMPT TO EAT A GINORMOUS FULLY LOADED 5 LB BURGER WITH 54 TOPPINGS……IN UNDER 30 MINUTES. 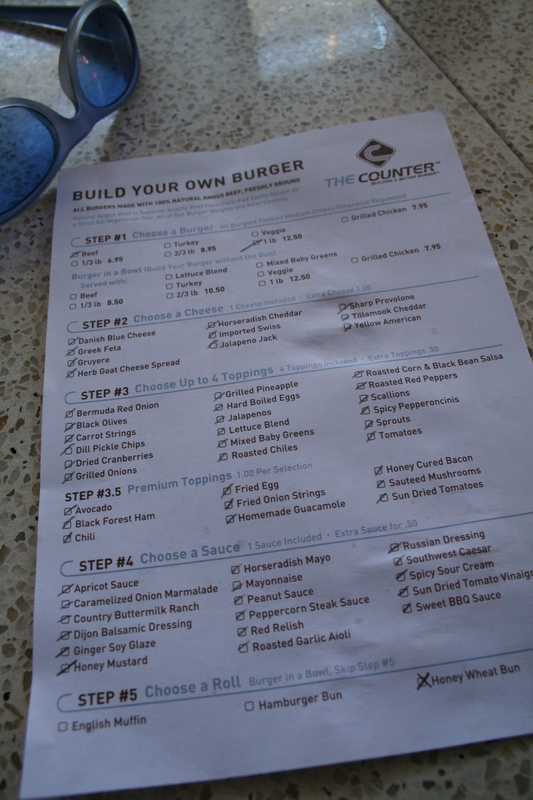 This past Saturday, a few friends and I went to check out this new burger place called The Counter in Palo Alto. Their whole pitch is that you get to build your own burger: pick your meat, size, cheese, toppings, sauce, and bun type, and you’re good to go. And a bunch of their options aren’t too shabby, either. For example, cheese options include gruyere, herb goat cheese pread, danish blue cheese, and tillamook cheddar. 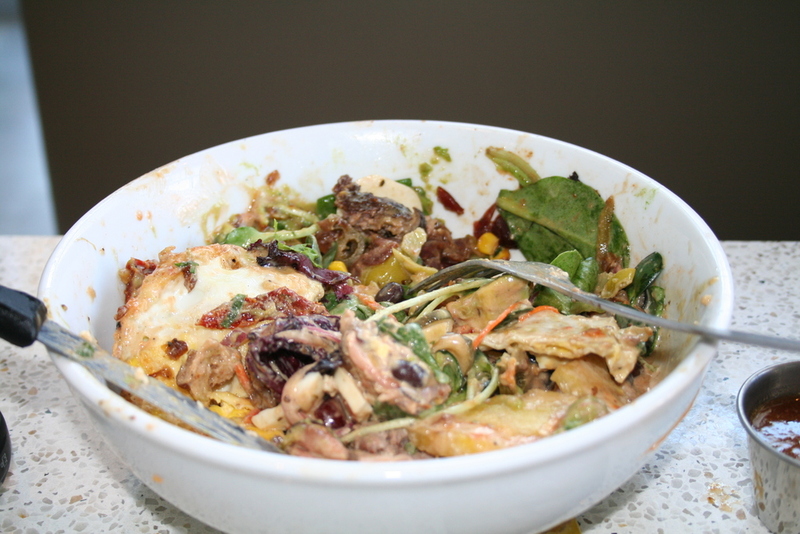 And toppings range from fried onion strings to hard boiled eggs to dried cranberries. Pretty much, there’s something for everyone here. So the day starts out innocently enough. Tim, TJ, and I all order a custom burger (when you’re seated you’re given a sheet of paper with a bunch of checkboxes; all you do is mark what you want on your burger), and we devour them the moment they arrive. We start talking about how two weeks prior, Tim had gone to Chipotle and easily ate three burritos in thirty minutes. Let’s order a burger with EVERYTHING on it. I mean, if you’ve got a sheet of paper with checkboxes all over it, someone’s bound to wanna check every single box on it. And mean it. So Tim decides to step up to the challenge: order a burger with every single possible option (all the cheeses, all the toppings, and all the sauces) AND try to finish it within 30 minutes. If he finishes it in 30 minutes, TJ and I will pay for it; if not, he has to cover it. Obviously, Natalie and Heather think we’re crazy. But after we assure them that we’re not just going to leave right after the order is placed, they begin to buy into the idea. The order is placed. We’re told that this has never been attempted before. Now how many toppings does this burger have? FIFTY-FOUR. We’re talking more than the number of states in the US. That’s 10 types of cheese, 27 toppings, and 17 sauces. And oh yeah, a 1 lb beef patty with a honey wheat bun. For anyone who’s ever gone through a drive-thru window at a fast-food joint and joked, “Let’s order every single item on the menu!” this is pretty much the same thing. Below’s the complete list of what went into the burger….. While we’re waiting for the burger to arrive, it seems as if Tim has already become a celebrity. Nearly the entire staff at The Counter comes on over to say hi (including about 10 waitresses who all are like, “Are you really going to do this? That’s kinda gross! But it’s kinda cool too!”). The manager pops on in, a guy who appears to be one of the owners says hey, and the executive chef even stops on by to see who’s about to eat this behemoth of a burger he’s cooking up in the back. Yup, everyone is f’ing excited. 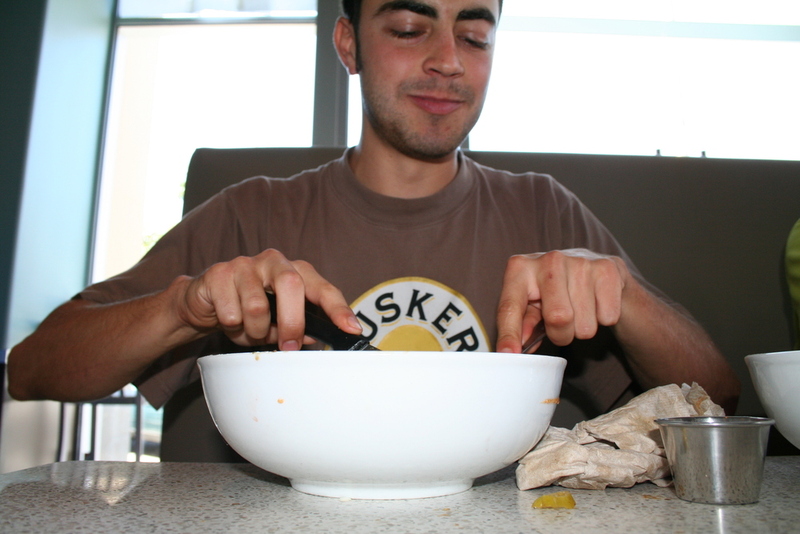 To prepare himself, Tim reorganizes the burger a little bit. He dumps a bunch of the sauces onto his burger, spreads a few on the bun, and saves one on the side (the idea was that if he were to actually finish the entire burger, he would down it as the finishing touch). He also cuts up some of the patty and puts it in another bowl (possibly in an attempt to make the burger look less intimidating). So as you can see, the 30 minute mark hits and Tim has unfortunately not completed the task. TJ and I discuss and decide that the immense entertainment value we are getting out of this warrants a 15 minute time extension. At this point, Tim’s obviously struggling to get even a bite in. 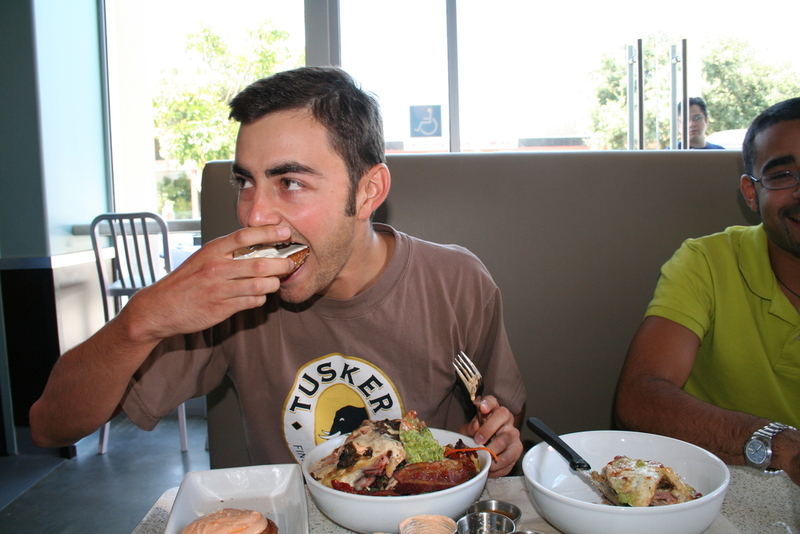 Remember, he had eaten a full meal right before starting the challenge. He also informs us at this point that maybe it wasn't a good idea that he had a full plate of pancakes for breakfast. So at the 36 minute mark, he decides to officially call it quits. Nevertheless, we are all very impressed with how far he made it. The check then arrives. 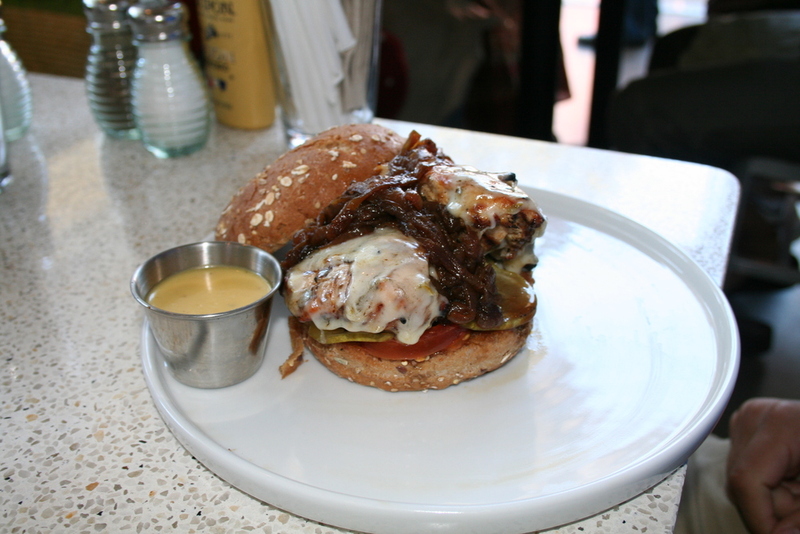 The ginormous burger ends up costing $45.50. I think it’s the best $45.50 one could ever spend. We’re also asked to fill out a comment card. The most hilarious part of that card is the part that says “Please list the items that you ordered.” Ummmm, EVERYTHING?! Well, that’s pretty much it. A big thanks to the whole crew at The Counter for dealing with our craziness. And of course, thanks to Natalie and Heather for actually processing the order. I’m sure we’ll be back soon to try the challenge again. 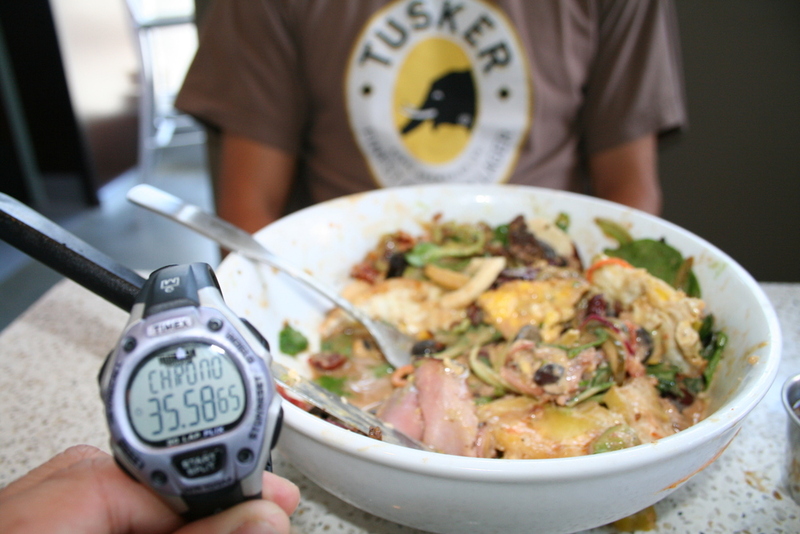 Tim says that he can probably do it if he starts on an empty stomach. I actually don’t doubt him. I’ll keep you all updated. But wait, you say, did the burger eventually end up getting finished? To view the full gallery of photos from this momentous occasion, check out the Flickr album HERE. And that's it. Stay hungry, my friends.